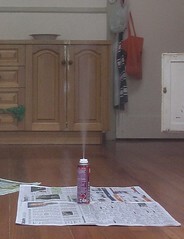 On Saturday I set off bug bombs around the house. Five of them, one in each major room. Hopefully it would spell armageddon for the cockroaches. Once set, I went for a wander for a couple of hours. Along the way I noted Zagarelli’s, the crap restaurant I once dined at, which then changed its name, has now shut down completely. No loss to the local cuisine. Returning after the requisite two hours to open up the house and let fresh oxygen in, I found two dead cockroaches (one on the floor, one upside down in a glass of water — euch). Since then another two have been found. Hopefully that’s put paid to them, at least for a little while. On a completely separate note, Jeremy turns 9 today. We celebrated with family on Sunday. I won’t claim it seems like yesterday, but certainly it’s not too long ago that he was just a small pink crying baby. Time flies, does it not. One of my presents to him was a copy of the latest Guinness Book of Records. At his age, I had a 1970s edition — it might have been 1974. In my teens I upgraded to a 1987 edition. As many people do, I gradually lost interest as I grew older, and eventually got rid of it in 2003, but having a read of Jeremy’s shiny new copy, it is surprisingly interesting. I wouldn’t read it from cover to cover, but there’s enough to just dip into it — and both the kids seem fascinated by it, just as I was back in the day. Happy birthday to Jeremy! May he have record-breaking happiness in his life. Yay for getting rid of the cockroaches. May you never see another one in that place. Ugh…. A few years ago we had a Mathematics lecturer come and give us a talk about his new program that was to do wonders for our mathematics teaching at work. I’m sure both your boys will get great enjoyment out of the gift. when you lose a good bookshop, its like losing a friend. when i was younger, in those distant pre-interweb days, it was one of those places where you knew you coudl find a book on whatever pet topic was on your mind at the time. the book usually would be at the top of the tall bookcases, or on the big tables, and prob cost 60 bucks, but at least they had it. So, how big are Aussie cockroaches. Daniel, let’s just hope the roach bodies don’t spell out “All of your base are belong to us”.